The choir loft contains, as has every cathedral building since 1581, a pipe organ. The magnificent four-manual organ by Pels Organ Makers of Holland, one of the largest in the Far East , provides liturgical music for the services of the cathedral. 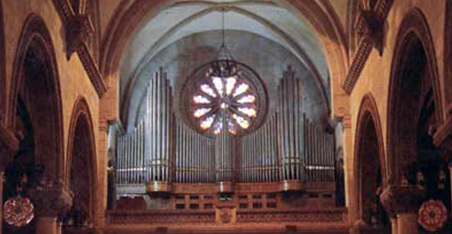 In addition, world-renowned organists such as Maestro Flor Peeters and Madame Odile Pierre have performed organ recitals in the Basilica. The choir loft is located behind the façade above the main entrance of the cathedral. The area is illuminated dramatically by two round stained glass windows bearing ornamental motifs of angelic musicians and musical instruments. Each window is dominated by figures of King David at the harp and St. Cecilia at the organ, exemplars of sacred music of the Old and New Testament, respectively.